The Senate early Saturday passed broad tax reform legislation, setting up conference committee talks with the House on a range of tough issues, including Arctic drilling and clean energy incentives. In a historic early morning roll call, senators voted 51-49 for the Senate's tax bill, the final version of which was unveiled only hours earlier, prompting howls from Democrats over the limited time to review text of such consequential legislation, which included handwritten changes they said were illegible. Just one Republican — Tennessee's Bob Corker — joined with every member of the minority to oppose the legislation. The retiring Corker voted "no" to protest the measure's $1.474 trillion 10-year price tag, after GOP leaders failed to deliver on a promise to address deficit concerns. The House will vote tonight to formally go to conference with the Senate, where Majority Leader Mitch McConnell (R-Ky.) struck an upbeat tone on negotiations yesterday. "We'll be able to get to an agreement in the conference. I'm very optimistic about it," he said on ABC's "This Week." White House legislative director Marc Short was more candid Friday, telling reporters, "All of this is a difficult process." The many differences that must be reconciled include competing proposals to scale back state and local taxes and mortgage interest deductions, as well as the Senate's late decision to retain the corporate alternative minimum tax (AMT). While they may assume a lower profile in the talks, conferees will also have to sort out differences on oil and gas drilling in Alaska's Arctic National Wildlife Refuge and the tax treatment of clean and renewable sources. ANWR will likely be the highest profile energy fight in talks to merge the House and Senate bills into one product Republicans can pass. 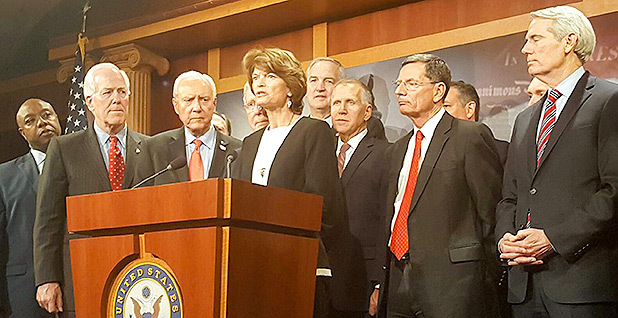 Senate Energy and Natural Resources Chairwoman Lisa Murkowski (R-Alaska) was cautiously optimistic that the ANWR provision that passed Saturday would remain. "I feel pretty good," she told E&E News on Friday, noting that she had spoken with both Speaker Paul Ryan (R-Wis.) and McConnell about the issue. "There's a pretty solid commitment to ANWR." To fix a procedural glitch that threatened Murkowski's drilling language, the revised Senate bill authorizes the sale of up to 7 million barrels of oil from the Strategic Petroleum Reserve in fiscal years 2026 and 2027, with the amount of revenue capped at $600 million (E&E Daily, Dec. 1). As expected, Energy and Natural Resources Committee ranking member Maria Cantwell (D-Wash.) tried to strip the ANWR language from the tax bill, but the gambit failed in an early-morning vote by 48-52. Maine Sen. Susan Collins, a moderate who is close to Murkowski, was the lone Republican to support Cantwell's amendment. West Virginia's Joe Manchin was the sole Democrat to vote for keeping ANWR in the bill. Environmentalists are turning to the conference process in a last-ditch effort to keep ANWR off-limits to drilling. They were buoyed last week by a letter from a dozen House Republicans to leadership opposing opening ANWR. While resistance from House GOP moderates previously helped scuttle an earlier attempt to allow drilling, Sen. Dan Sullivan (R-Alaska) said Friday he was not worried that ANWR would be jettisoned in conference. "I think we have a strong vote for ANWR over there," he said. "If you take a look, those guys didn't say no, and a lot of those guys didn't vote for the bill anyway." At least one House Republican who signed the letter, Carlos Curbelo of Florida, said Friday he was unlikely to oppose the final tax bill he helped to write as a member of the Ways and Means Committee. "I'm concerned about that, it's not in our bill," Curbelo told E&E News on Friday of ANWR. "I don't think a tax bill is the appropriate venue to address that issue. Am I willing to throw away tax reform completely over the issue? Probably not." In conference talks, Murkowski said she plans "to do everything that I can to make sure that the promise to Alaska is fulfilled and we're able to open up ANWR." Conferees will have to sort out familiar tensions over renewable energy incentives as well. A key issue will be the House bill's reduction of the value of the renewable production tax credit by nearly a third, as well as new qualification terms for some projects (E&E Daily, Nov. 3). The House, unlike the Senate, would also extend a key nuclear tax credit, along with incentives for a host of orphaned renewable sources that were left out of a 2015 tax deal. It additionally would end the $7,500 electric vehicle credit. The Senate bill largely punted on these and other energy issues, which GOP Finance Republicans said they hope to address through separate legislation later this year. However, that may be a heavy lift, given the legislative crush and limited time before the holiday recess. House Ways and Means Chairman Kevin Brady (R-Texas) said last week no decisions had been made on a separate tax bill, keeping energy a live issue for the conference. Another pressing issue are concerns by renewable energy firms that base erosion anti-abuse tax (BEAT) language in the Senate plan may inadvertently stifle foreign investment in U.S. projects by making them subject to a 100 percent tax (E&E Daily, Nov. 30). A late push by Sen. Cory Gardner (R-Colo.) and others to fix the issue fell short, prompting a coalition that includes the American Council on Renewable Energy, the American Wind Energy Association, Citizens for Responsible Energy Solutions and others to urge conferees to keep working on the BEAT provisions and the corporate AMT. "If these provisions are retained, they will result in broad instability and uncertainty for businesses and investors across many sectors, including the clean energy sector," the groups said in a joint statement. "We look forward to working with conferees to address these concerns so that the sector can continue to contribute to vibrant and diverse domestic energy production," they said. However, the Koch-aligned American Energy Alliance think tank urged conferees to maintain the Senate's current BEAT provisions and the House's reduction of the PTC. "It's time to wind down Big Wind's system of giveaways and allow genuine price signals to guide our selection of electricity generation," said AEA President Tom Pyle in a statement. The Senate's AMT provision was denounced by Murray Energy Corp. CEO Robert Murray over the weekend as a "mockery of tax reform" that would hurt coal mining firms "much worse than the status quo." "Undoubtedly, when President Trump called for comprehensive tax reform, he never intended for our nation's coal miners and workers in other industries to be further burdened with more job-killing federal taxation from our United States Senate," Murray said in a statement.